Set against the backdrop of mountains, this is an offering of a private room in a shared homestay, ideal for a small group of backpackers. 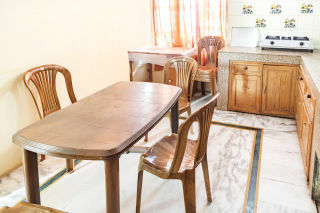 The property is located 1.7 km from Mall Road, and the room on offer can accommodate up to three people. 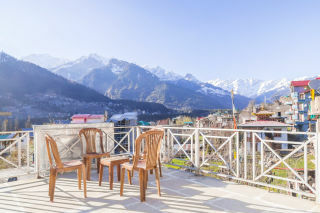 Your Space This hip-roofed stay has a terrace sit-out with ample seating and tables, so you can enjoy a hot beverage and gaze at the stunning view of the mountains. 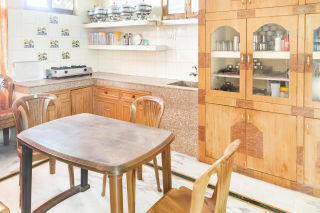 Inside, the kitchen is equipped with basic utensils and a gas hob for you to prepare a quick meal at any time of the day. Comfortable seating in the dining room ensures all your meals are enjoyable. The room on offer features wall-to-wall carpeting and is furnished with a comfy double bed, a chair, and a coffee table. A television is also placed here to keep you entertained while you are indoors. The en suite washroom is tiled and appointed with western sanitary ware and modern fixtures. Guest access - You are allowed access to the parking area, the terrace sit-out, and the common dining area. Guest interaction - Our staff is always present at the property premises to assist you with your itinerary. Neighbourhood overview - Our property is located away from the city, nestled in the rich green vegetation. The magic sights enhance your perfect destination for you to unwind. 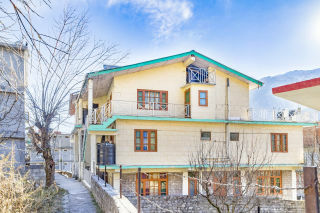 The cottages are designed to give you an unparalleled ambience. It has to be experienced to be believed. The property is close to local eateries as well. Getting around - The nearest airport and railway station are in New Delhi. 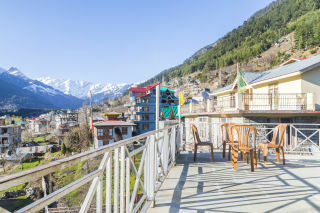 From there, you can hop into a bus to get to Manali. A cab can also be a convenient mode of tansportation. Additional information - You can use the kitchen at an additional charge. You can also order any meal from our menu. It is a gated property. Smoking is allowed on the terrace. We request you not to get your pets along for the convenience of fellow travellers. Simple place with good hosts. Host helped us arrange for sightseeing etc in a reasonable price. The place was clean and was a good value for the money we paid for. 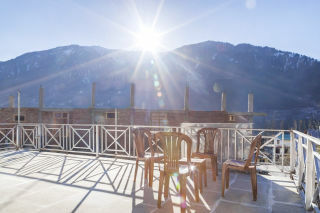 The most comfortable place with the wow view of mountains and yumm food! Well Maintained Homestay having Indoor Fireplace. Manali Bus Depot - 1 km Manali is well connected by road to Delhi through NH-21 and NH 1, leading to Manali from New Delhi.